Injuries are the worst, especially if they just happened. The phrase ‘break a leg’ used to wish someone the best of luck is used ironically because breaking a leg is the worst thing that could ever happen to anyone. 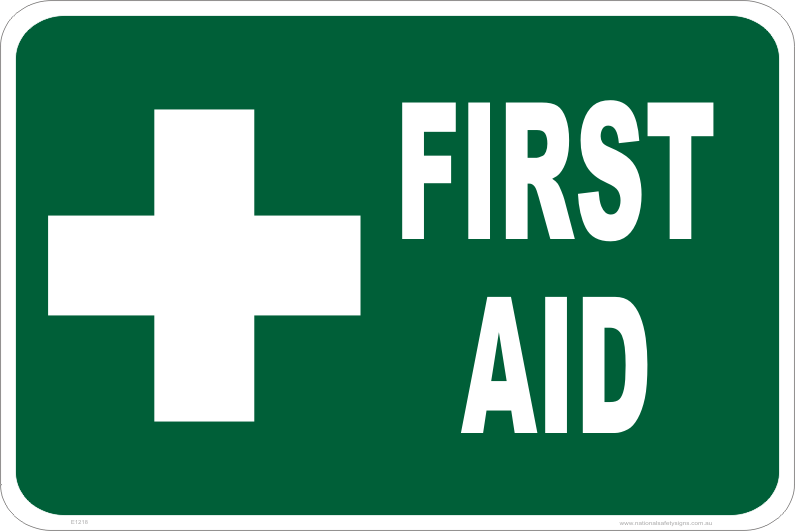 However, with proper immediate first aid, one can help alleviate some of the pain. Today we will be focusing on muscle and bone injuries that are usually acquired through sport and overexertion. A strain, also known as a pulled muscle, as its names suggests, is a muscle that is stretched too drastically, or perhaps even torn. A strain is extremely painful, and is usually caused through overuse of the affected muscle, using the muscle a wrong way, or accidents. Insufficient stretching of the muscle to ‘prep’ it for use is the main cause of strains. Individuals are advised to refrain from starting their intensive exercise regimes until adequate stretching is done. When someone receives a strain, the first signs usually include pain and bruising around the affected area. Swelling will also be observed. Place a pack of ice on the affected area with a cloth, and do not place ice directly on the skin. Doing so can cause frostbite. Ice helps with the swelling and sensations of pain, as it significantly reduces inflammation and nerve activity. Periodically ice the wound(every 15 minutes), and rest the strained area until the pain is gone. It usually takes a week of recovery before the pain is substantially reduced. Do not use the muscle while you feel pain, and you can begin to use the muscle lightly once it has faded. Seek medical attention if symptoms do not improve after 24 hours, if pain is too severe, if a popping sound is heard, or if there is inability to move the muscle. Your doctor may prescribe medications to help with the inflammations, and will be able to thoroughly assess your condition. Panadol can help you manage the pain as well. Sprains may sound similar to strains, but they are not the same. Sprains are injuries to your ligaments(the tough, fibrous tissue that connects bones to other bones). First aid for sprains are extremely similar to strains though! 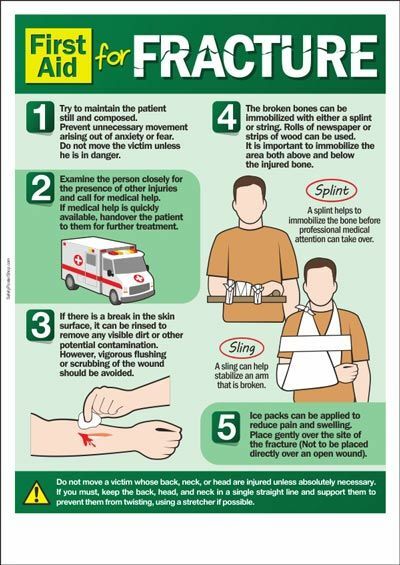 Immobilise the affected area by telling the individual with the sprain to not move, and make a makeshift splint if necessary. 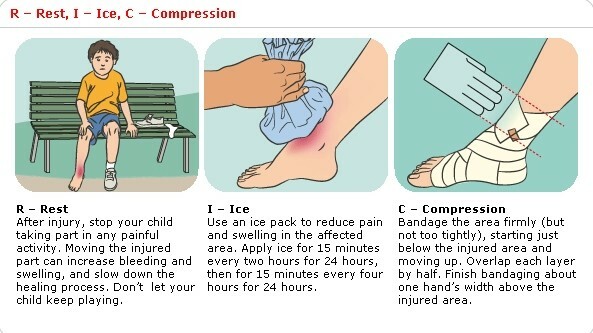 Ice the wound periodically(every 15 minutes), but do not the ice directly on the skin. Use a cloth. Rest until the pain dissipates, and do not use the affected body part until the pain has faded. A fracture is when your bone literally breaks when enough force is applied to the bone to the point where the bone can no longer hold itself together. There is usually intense pain accompanied by a fracture, and bruising and swelling as well. There might even be bone protruding from the skin. The first course of action is to ensure the affected area is not moved until it is attended to by medical staff. Then, tell the individual to not touch the affected area(one would usually not anyway, due to the pain). Make a makeshift splint if possible, to immobilize the wound. Apply ice(but not directly) to the affected area, but do not touch any protruding bone. Simply attempt to minimise inflammation and swelling. The second course of action is to bring the individual to a hospital. There are many variations of bone fractures, and only a trained medical staff can assess what is the next best course of action. This can include using localised anaesthesia to set the bone, may require a cast, and is usually determined after an X-ray is taken. However, an X-ray might not be sufficient in elucidating an injury, and further tests might be necessary. Once proper medical treatment has been done, the bone should begin healing by itself over an extended period of time(1-3 months). Next Article Modern Medicine or TCM?